Why choose Sherri Peroni Photography? I take pride in offering a professional maternity, newborn and baby portrait studio. As a Mother myself, I understand the awe and wonderment that accompanies the journey of watching your baby grow: from the first butterfly flutters in your belly to the euphoric excitement of snuggling a new baby and the delight in discovering their first achievements. These moments truly do fly by, and nothing brings you back to these moments like a photograph. Experience: After photographing hundreds of newborns over the past 5 years, I’d like to confidently say that I know what I’m doing! Working with so many newborns and babies has allowed me to adapt and adjust to each different scenario that may come up (whether it be a baby who is shy and crying at their session to a newborn who has no plans on sleeping!). You won’t have to worry about whether or not your session will be a success, if your baby is safe or if the end result will be high quality. You can relax and entrust in my expertise. 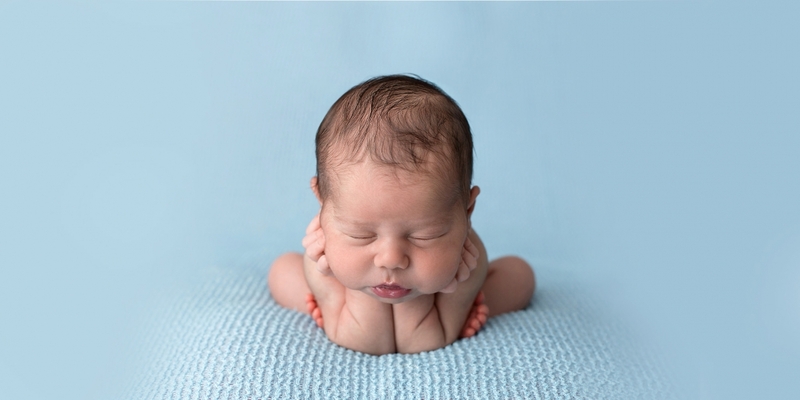 Newborn photography is not regulated, however, professionals will invest in quality, reputable workshops that train them on posing safety, correct light placement, and proper image enhancement. I have taken numerous workshops like this over the years (including workshops with Allison Cahoon, Stephanie Robin, Sarah Ulrich and many more) and always make sure that the photography props and equipment used are of the highest standards. Visit my Newborn Safety page for more information. Specialty: I specialize in photographing maternity and baby’s first year, which means documenting Mom’s growing belly, baby’s tiny details at the newborn session, the smiling milestone at the 4 month session, the sitting milestone at the 7 month session, the crawling milestone at the 9 month session and the standing/walking milestone at the one year session. All of my time, energy, education and even props are dedicated to these specific sessions. Products and Digital Files: We live in a digital age now, therefore, all of my sessions include high resolution edited digital images from your session with a print release so that you may print, scrapbook, share, archive, etc the memories from your sessions with me. I do also offer beautiful, quality products for you to proudly display in your home. Modern, neutral style with a pop of colour: Clients have happily mentioned that they enjoyed the simple, timeless, neutral yet modern approach that I lend to all of my sessions. Clients are asked very specific questions about style and the colours in baby’s nursery or their family room and careful consideration is taken to design a session that complements these colours. I have chosen to photograph sessions in a way that is less trendy so that photos are not dated – I want you to be proud to display them for years to come! Some clients ask why my services ‘cost so much’. The answer is simple – you are hiring a professional photographer running a full-time portrait studio who dedicates her time, expertise and talent to ensure that these milestones in your life will be documented perfectly and professionally. I do not share any of my time with another day job; My photography studio is my full-time career. This expertise and dedication is reflected in the cost to ensure that every little detail is handled professionally.